When looking at Schwarzeneggers bodybuilding photos, its hard to imagine he himself was once just a young man with an average body and an extraordinary will to succeed at achieving his set fitness goals. Inspired by another bodybuilder (who later became his lifelong mentor), Reg Park, Schwarzenegger has carved his name in history as one of the most prominent bodybuilders ever. But just like any of us, even he had to start somewhere. Read on to find out more about Arnolds first fitness routine and start working on your physique today. The main task for a beginner bodybuilder is to work on the muscle size youll shape in the next phase of the workout. This is achieved by fueling the body with the exact kinds of nutrients it needs. Schwarzeneggers nutrition relied heavily on protein and his famous rule was to consume one gram of protein for every pound of bodyweight. This means you should reassess your diet plan to fit your new workout routine and combine viands eggs, lean beef, chicken, salmon, nuts, protein shakes, full-fat cottage cheese, etc. Dont forget to rest: you need a full 8-hour sleep to endure through the program. Before even stepping to the gym, you need to ensure you have the right equipment to reduce the risk of injury. Youll be needing weightlifting gloves to prevent the bar from slipping your hands, as well as protecting your skin from blisters and calluses. A great pair of bodybuilding shoes will ensure stability, improve your body posture, and allow you to pull up the weight easier. If you plan on training with heavier weights, think about investing in a weight belt to protect your lower back or straps that help you get a better grip whilst lifting. The core of this beginners routine lies in dividing the body into separate muscle groups: back, shoulders, chest, arms, forearms, thighs and glutes, waist, and calves, and then segmenting these groups into smaller sections. Beginners should target all of these muscle groups through a two level program. 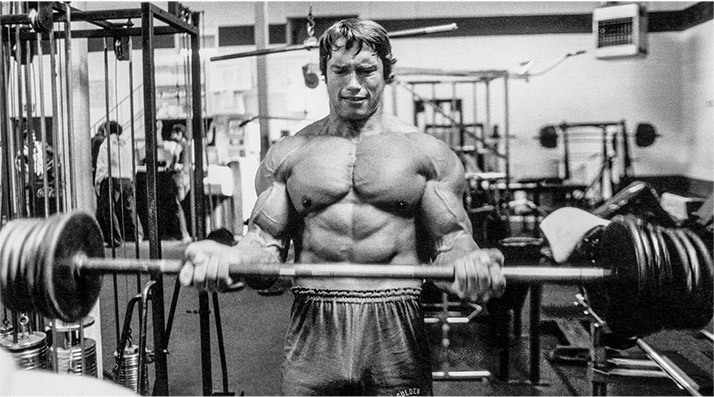 Schwarzenegger used a split system training which implies working on particular groups of muscles in one training session, not your whole body at the time. 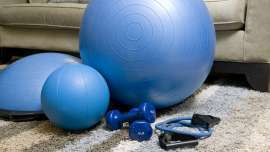 Youre expected to exercise six times per week, with a mandatory seventh day of rest, so your body can recover. Level one implies exercising each body part two times per week, using a 3-day split. This doesnt include the abs since you should do crunches six times per week. So, it takes three days to train the whole body. Heres one way you can organize your sessions. On Monday, you work on your whole chest and back. Tuesday is for shoulders, upper arms, and forearms. Wednesday is for thighs, calves, and lower back. On Thursday, a new cycle begins: you work on the whole chest and back again, just like you did on Monday. Friday is reserved for the same muscle groups as on Tuesday, and Saturday is the same as Sunday. Thats the mentioned 3-day split. Its recommended to do five sets of 8-12 repetitions. You can vary the type of exercises, the only thing that matters is to hit the right target muscle group. So, for example – when working on your chest, you can incorporate bench and incline press, pullovers… Whatever you like, as long as all the muscles assigned for the workout are included. You should move to level two once your body feels ready for a more challenging regime. Some get there more quickly, it depends on individual physical readiness. Level two training implies exercising each body part three times a week, using a 2-day split. Abs stay the same – six times per week. This time, the regime is more intense and it takes two days to train the whole body. On Monday, you work on your chest, back, thighs, and calves. On Tuesday, its time to work on the shoulders, lower back, upper arms, and forearms. Wednesday and Friday are reserved for the same muscle groups as on Monday, while Thursday and Saturday include the same exercises as the one you do on Tuesdays. The number of repetition stays the same (five sets, 8-12 reps). The thing with this workout program is that it demands full commitment and enduring through some discomfort. You need to learn to listen to your body, but also push it a bit over the edge, especially when it comes to gradual increase of the weights. Only then can you see true results and move on to some more demanding workout regime. The history of oil pulling and what are the benefits?